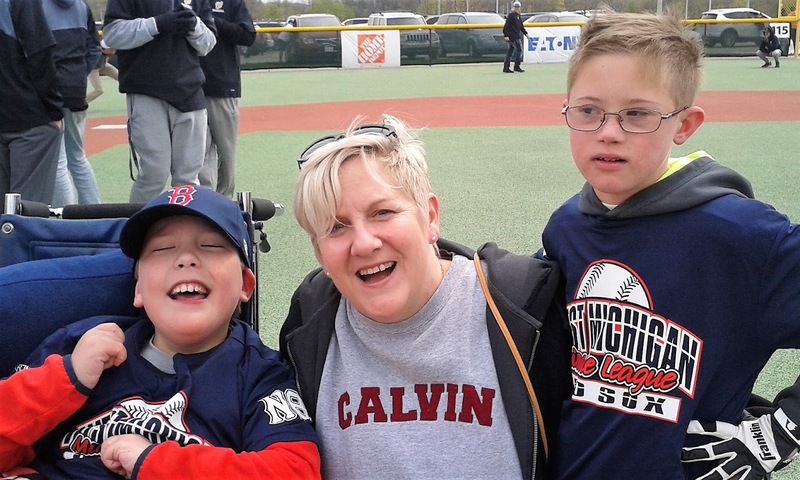 Most of you who have been following Cam know that the West Michigan Miracle League has been a part of our lives since 2014. The inaugural season opened in the fall of 2013 and Cameron wanted in for the second season. Since 2014, Cam hasn't missed a spring or fall season. As proud parents, we have watched a sometimes shy, tentative boy grow to have persistence, self-confidence and tenacity on the baseball field and in life. Each season and every game, we often see special guests appear...our Cam Fans...to cheer on our son. We cannot express enough thanks for the time put forth by others to light up that smile on Cam's face. For the opening game, Cam's teacher, Ms. Kathy arrived to cheer on two of her students- Cam and Brody, who just happen to be best buddies in Ms. Kathy's classroom. The boys have a teacher who not only excels at instruction and finding creative ways for her students to learn, but also is a huge baseball fan! Katherine (aka Ah-Dah), her husband Paul, and their super adorable son, Bexley, came out in the cooler temps too to cheer on Cam. Many different organizations volunteer their time each week- high schools, colleges and businesses all take turns. 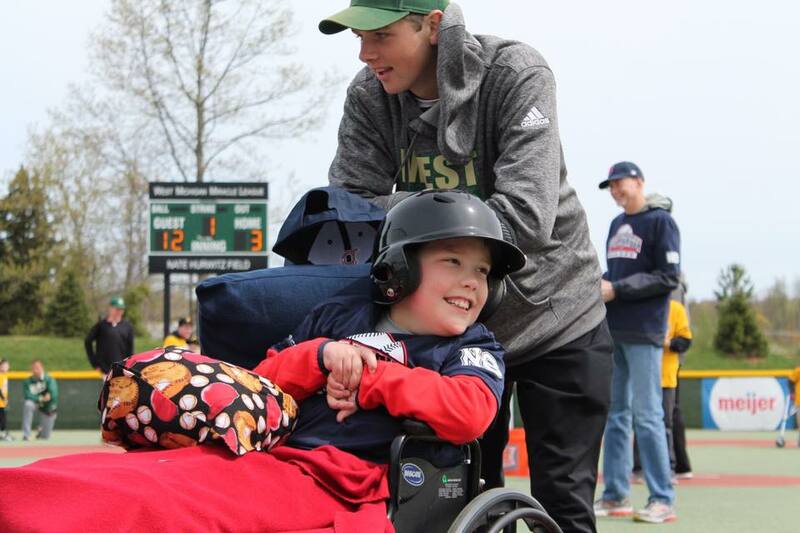 The volunteer helpers this week were from Zeeland West Catholic Baseball team. Three very cool baseball players hung out with Cam to assist. For the spring season, our baseball boy is a part of the WMML Red Sox team. It seems Oma never misses a game and she arrived early enough to ride over to the field with us, anxious to see her grandson play ball. We were fortunate enough to have her with us for quite a few days. Saturday afternoon, Cam and his grandma made some homemade gooey slime. Such a cool project (from the Auntie Jo basket) and one we'll be able to use over and over. We thoroughly enjoyed a delicious Sunday dinner with the Raisch fam and "Papa"/Mr. Ken. The end of the bathroom project is in our sights. The old shower door and adjacent glass were removed this week so we could clean the area and patch it. Due to this development, we told Cam we would need to use his shower for the next several days. "Ok, Mom and Dad. I will let you use my shower because you are nice parents and you do so much for me."